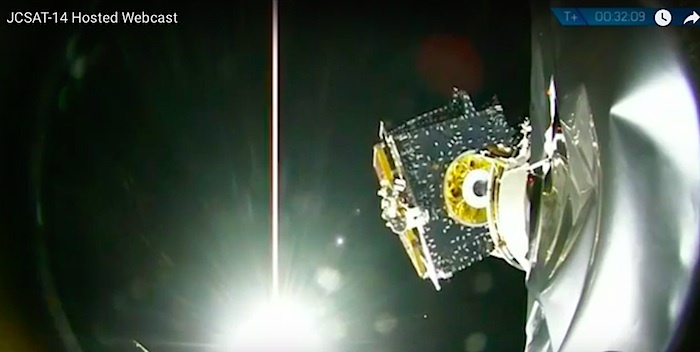 SpaceX technicians are attaching a Japanese communications satellite to the top of a Falcon 9 rocket ahead of a planned launch Thursday morning from Cape Canaveral. 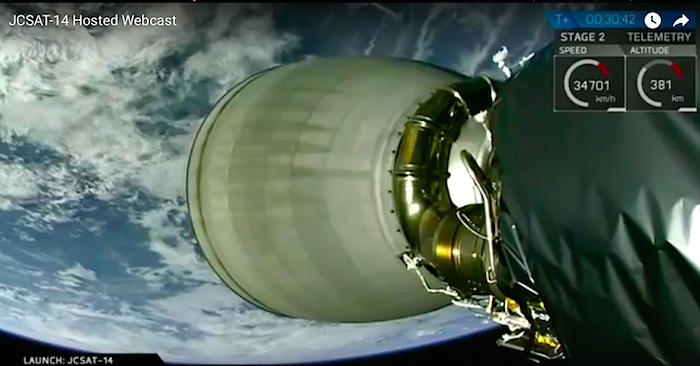 The JCSAT 14 communications satellite, made in California by Space Systems/Loral, is fueled and encapsulated inside the Falcon 9 rocket’s payload fairing. 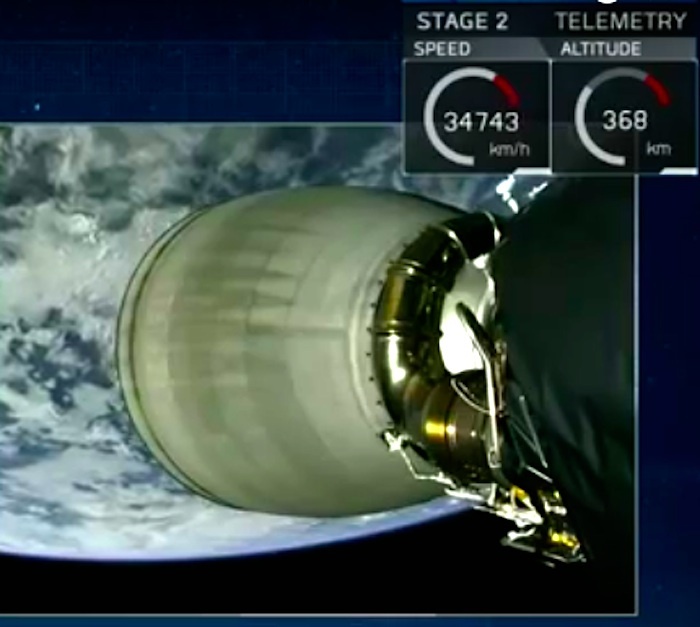 Workers were expected to connect the satellite with the launcher’s second stage inside the Falcon 9 hangar as soon as Monday. 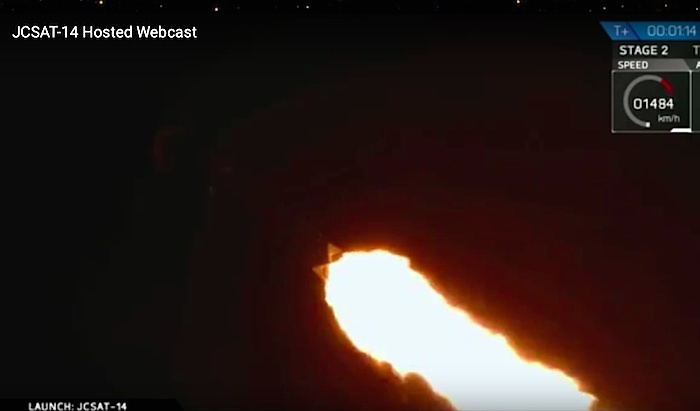 The rocket passed a key preflight test Sunday evening, when SpaceX’s launch team fueled the Falcon 9 with super-chilled kerosene and liquid oxygen and fired its nine Merlin 1D first stage engines for several seconds at Cape Canaveral’s Complex 40 launch pad. 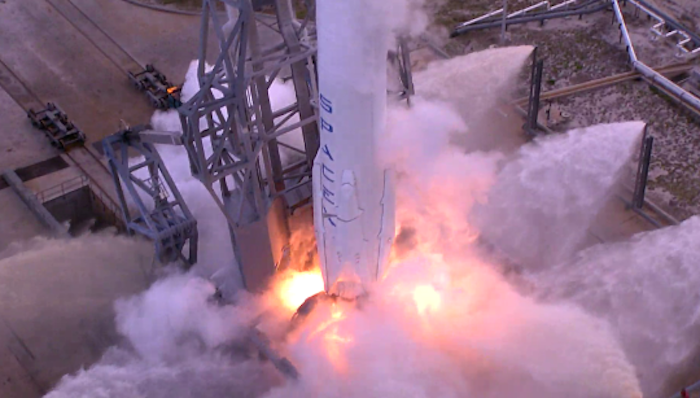 Hold-down restraints kept the rocket on the ground during the brief static fire test, a customary all-up check of the Falcon 9 and its ground systems before the real countdown begins. 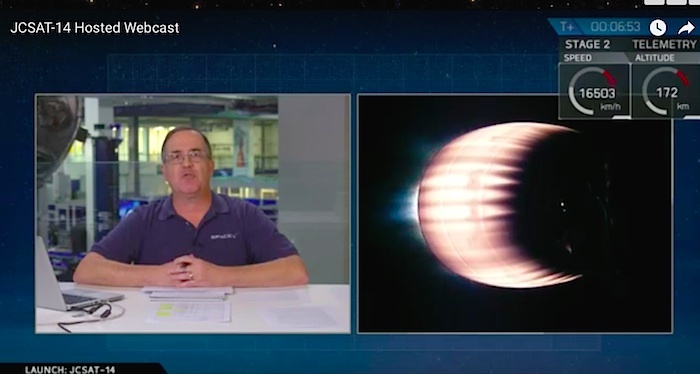 The static fire occurred without the mission’s satellite payload on-board, and SpaceX planned to return the rocket to its hangar, where the JCSAT 14 spacecraft and the Falcon 9’s nose cone were scheduled to be added. The Falcon 9’s fourth launch of the year is set for 1:21 a.m. EDT (0521 GMT) Thursday at the opening of a two-hour launch window. There is an 80 percent chance of favorable weather for Thursday’s launch attempt, according to the official launch forecast issued by the U.S. Air Force’s 45th Weather Squadron. A late-season frontal boundary is approaching Florida early the week, with rain and thunderstorms in the forecast for Wednesday. The primary weather concerns for Thursday morning are liftoff winds and the thick cloud rule, the Air Force weather team wrote in their forecast. The outlook calls for scattered clouds at 12,000 feet and 28,000 feet, northwest winds at 20 to 25 mph, and a temperature of 68 degrees Fahrenheit at launch time. If the launch is delayed to Friday morning, conditions should improve somewhat with a 10 percent chance of weather violating one of the Falcon 9 weather rules. 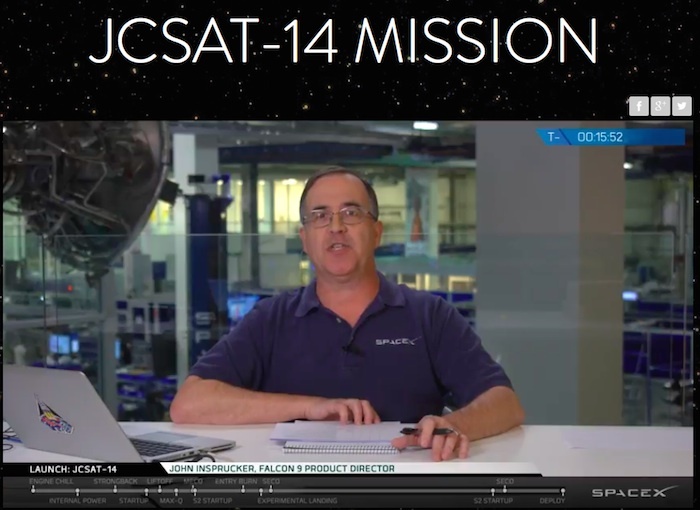 Owned by SKY Perfect JSAT Corp. of Tokyo, JCSAT 14 will provide television broadcast programming, data network services and broadband Internet connectivity across Asia, Russia, Oceania and the Pacific islands for a 15-year mission. 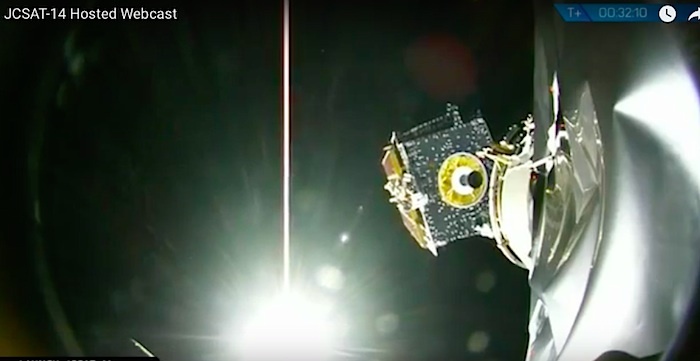 The Falcon 9 will deploy the JCSAT 14 satellite in an egg-shaped geostationary transfer orbit about a half-hour after liftoff, and the spacecraft’s on-board thrusters will steer it into a circular orbit nearly 22,300 miles (about 35,700 kilometers) over the equator within a few weeks. 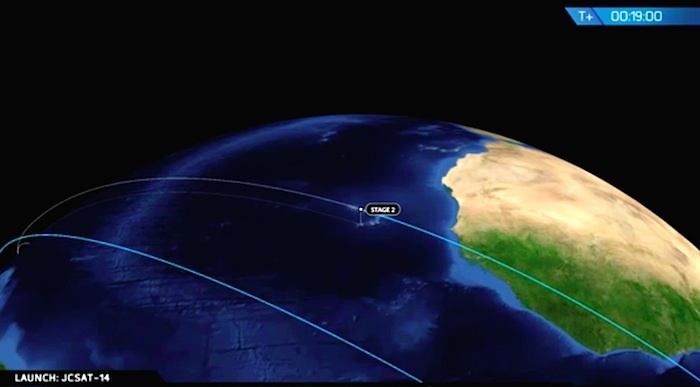 The distant orbit targeted by Thursday’s launch will require almost all of the Falcon 9’s propellant load, leaving little leftover fuel for landing maneuvers to touch down on a platform floating several hundred miles east of Cape Canaveral in the Atlantic Ocean. 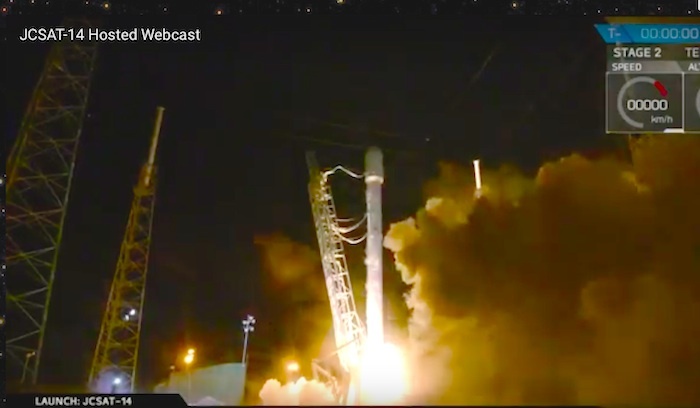 SpaceX successfully landed a rocket on the drone ship for the first time last month after a launch from Cape Canaveral with a Dragon supply ship. 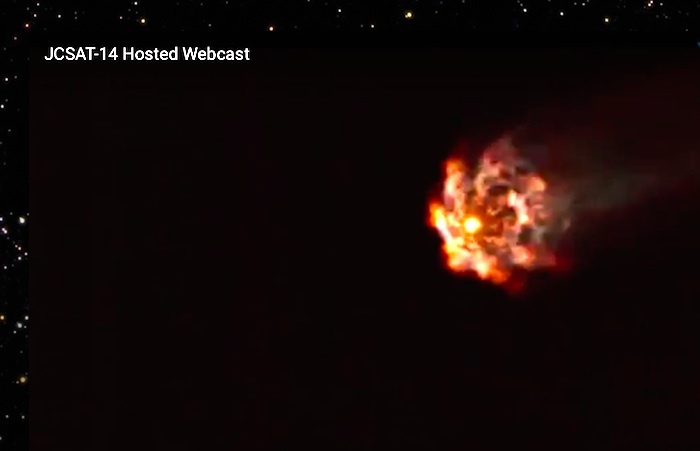 That mission went into low Earth orbit on the way to the International Space Station, requiring less speed than the orbit targeted on Thursday’s flight. 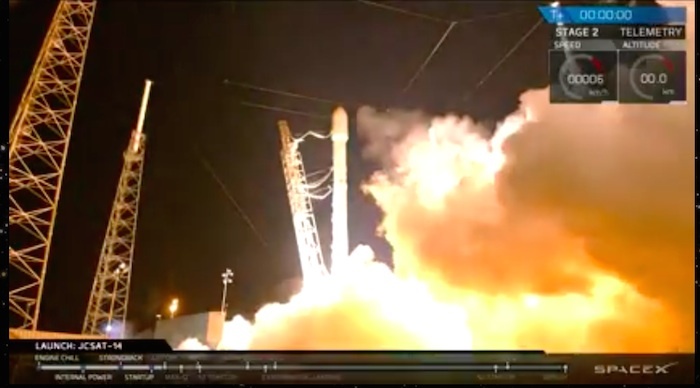 For the first time since its history-making takeoff and landing last month, SpaceX is launching again. 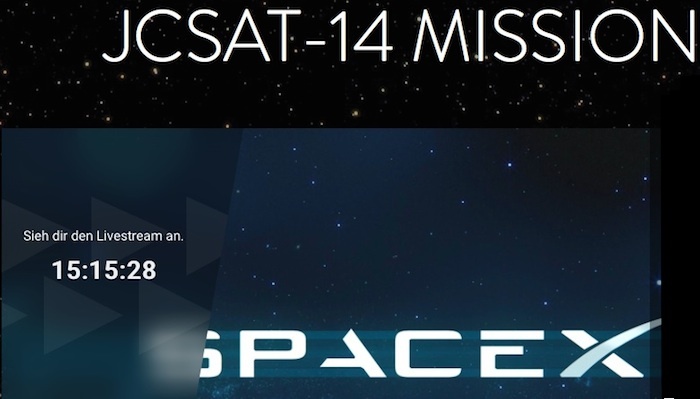 On Thursday at 1:21 AM Eastern, the Falcon 9 is scheduled to carry a Japanese broadcasting satellite into orbit. 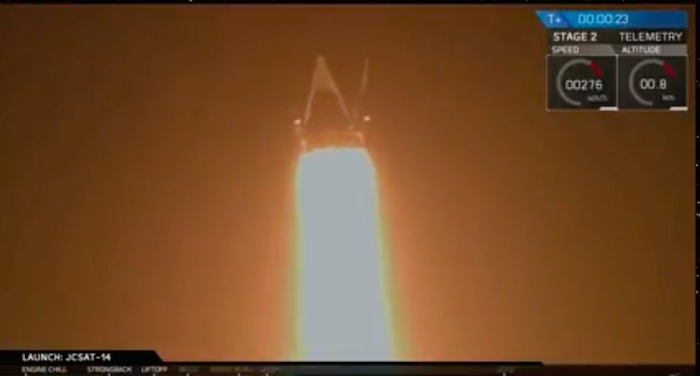 It will also try to repeat its landing feat. 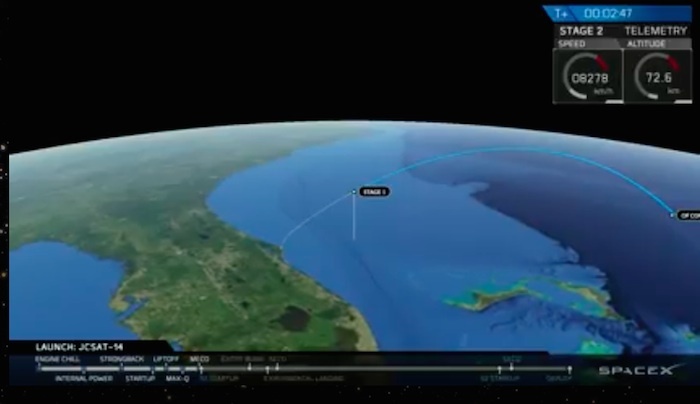 The rocket will take off from Cape Canaveral and deliver the satellite into geostationary orbit. 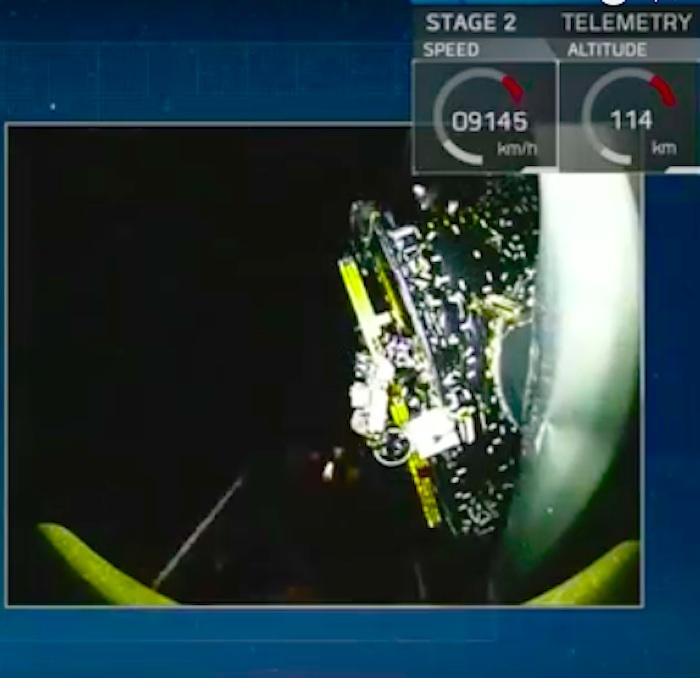 That's higher than the average satellite, which means the Falcon 9's first-stage booster will have less fuel left over when it comes back down for a landing. It will also be coming down faster, adding to the difficulty of landing on the 100-foot-wide barge. 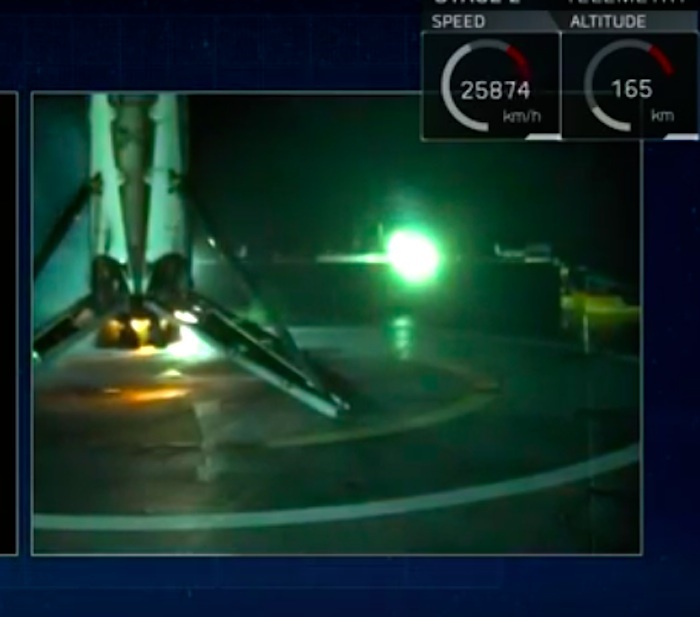 Although a successful landing isn't expected, SpaceX has surprised us before. There's an 80 percent chance of favorable weather, according to forecasters. 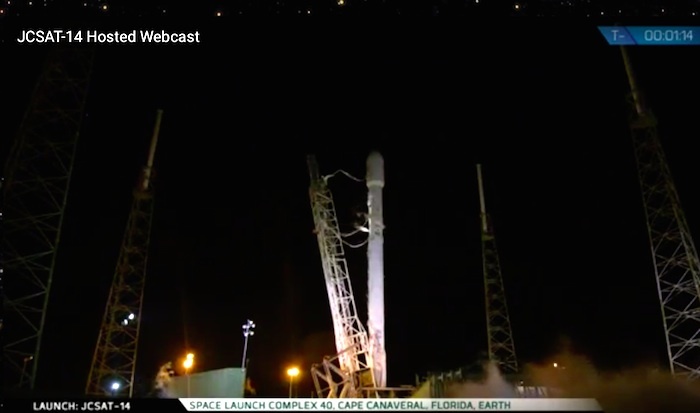 Due to the potential for bad weather, SpaceX has pushed back the launch to Friday at 1:21AM ET. 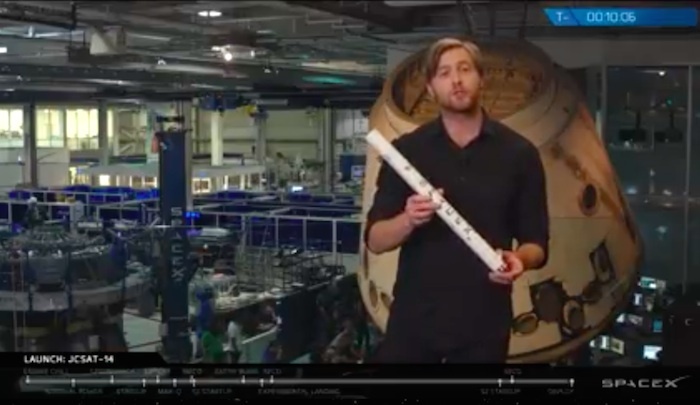 SpaceX is gearing up for its next launch this week, and this one is taking place well past bedtime (at least for those of us on the East Coast). 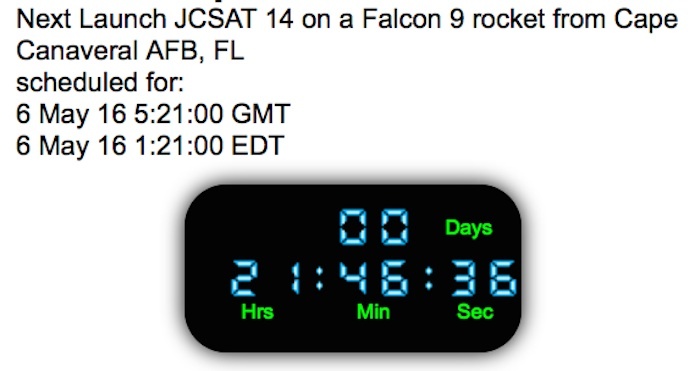 The company's Falcon 9 rocket is scheduled to launch a Japanese communications satellite, JCSAT-14, from Cape Canaveral, Florida at 1:21AM ET on Friday. 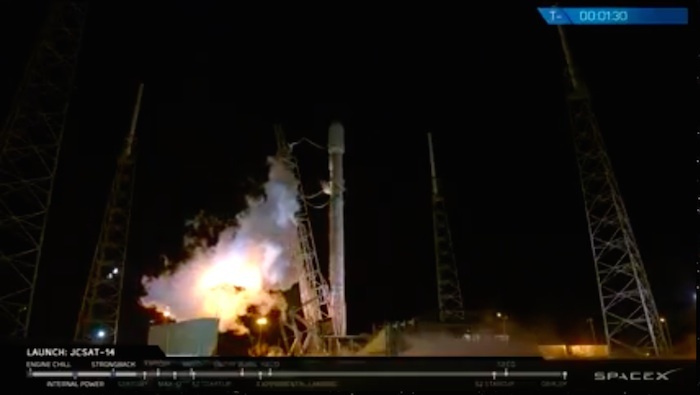 The launch was originally scheduled for Thursday, but was pushed back due to weather concerns. 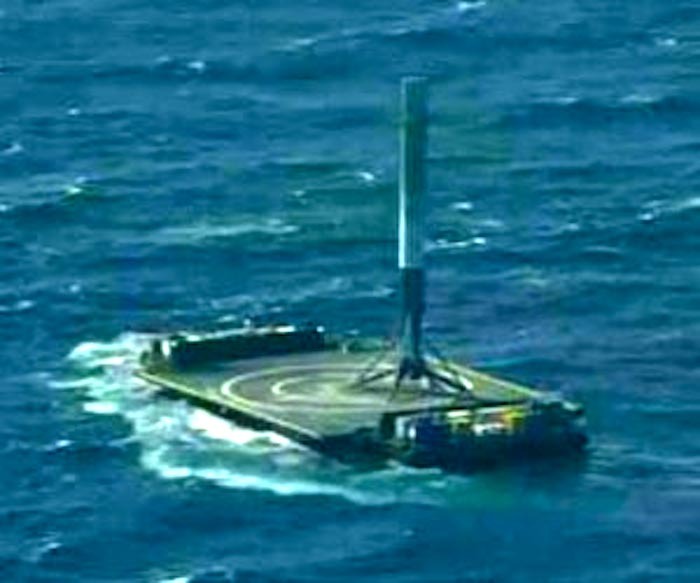 As usual, the company will try to land the majority of its rocket on a floating drone ship at sea — but SpaceX does not expect a successful vehicle recovery this time. 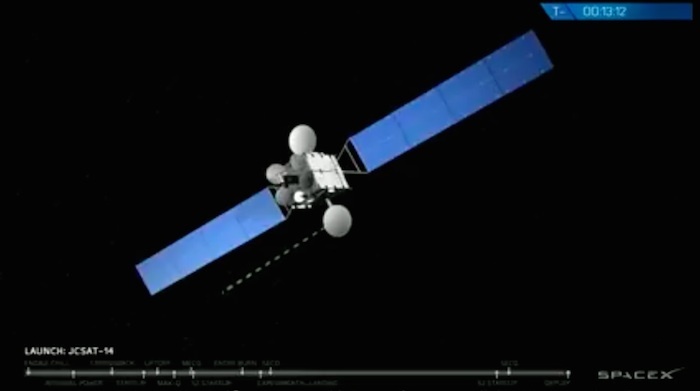 The Falcon 9 is meant to deliver the JCSAT-14 satellite to a very elliptical orbit high above the Earth’s surface, called a geostationary transfer orbit. 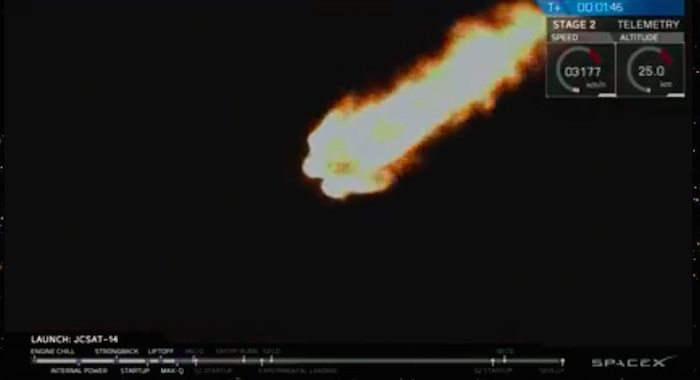 This high orbit is the reason that SpaceX doesn't expect the rocket landing to happen. 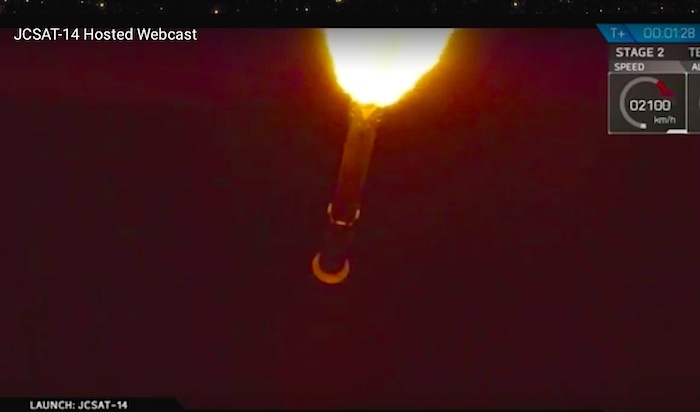 The company says that "the first-stage [of the rocket] will be subject to extreme velocities and re-entry heating, making a successful landing unlikely." 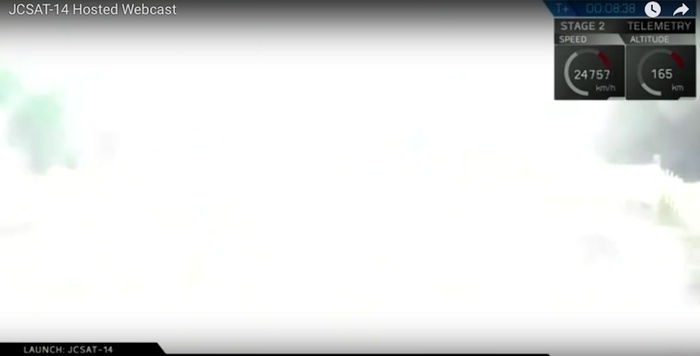 Additionally, getting to GTO uses up a lot more fuel than getting to lower Earth orbit. 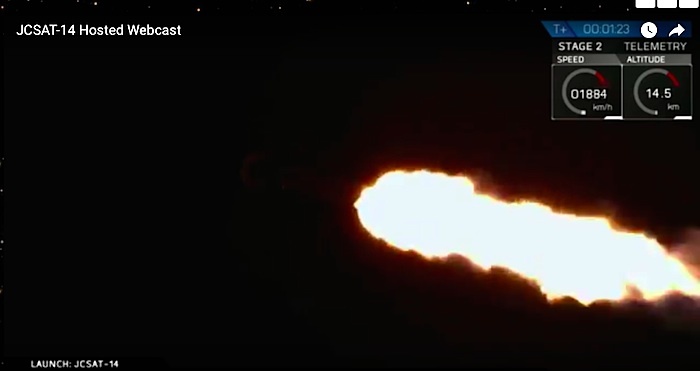 The rocket has to reach higher speeds to get up to the higher orbit, eating up a lot of fuel on the vehicle's initial ascent. 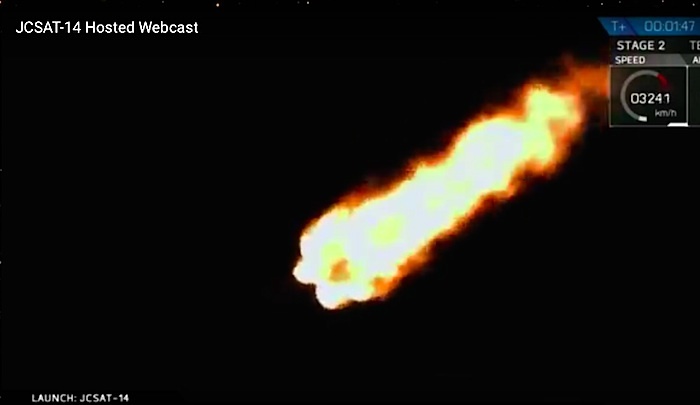 That leaves less leftover fuel for the rocket's return to Earth. 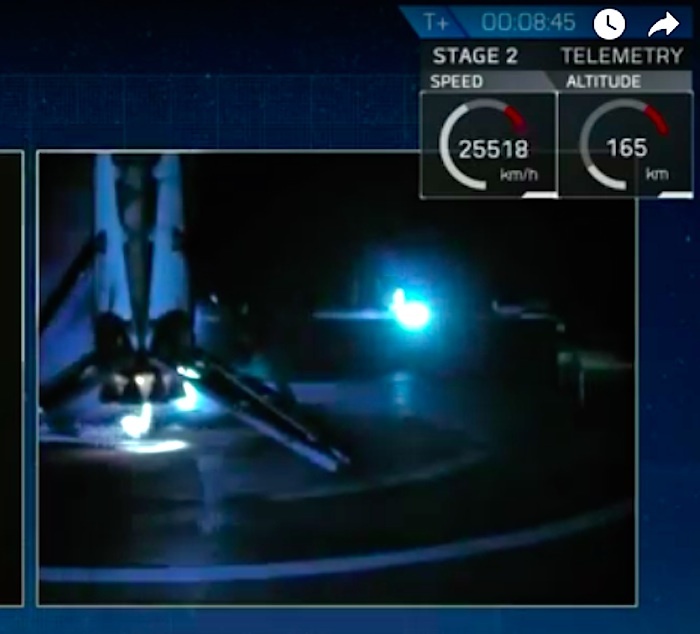 SpaceX finally pulled off its first drone ship landing in April, after many failed attempts over the past year and a half. 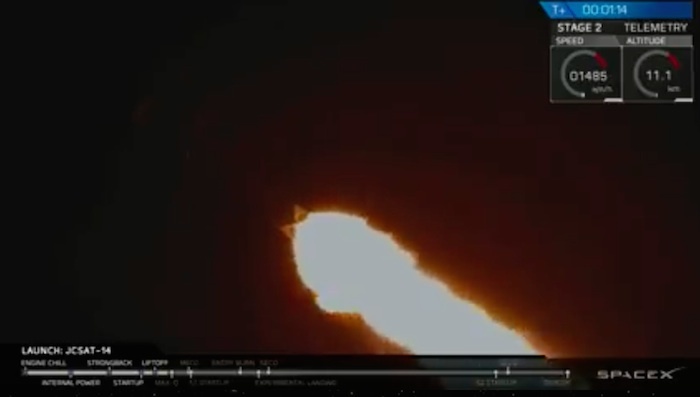 It was the second time the company has landed a rocket post-launch; the first time was in December, when the Falcon 9 touched down on solid ground at Cape Canaveral after launching a satellite into space. 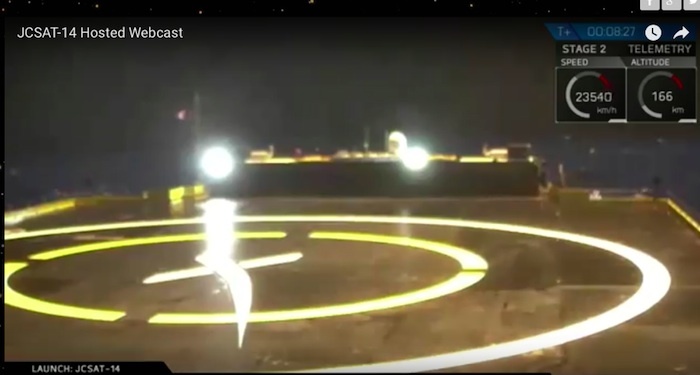 SpaceX has said that land landings are only possible for certain types of missions, while drone ship landings are better for missions that go to higher speeds. 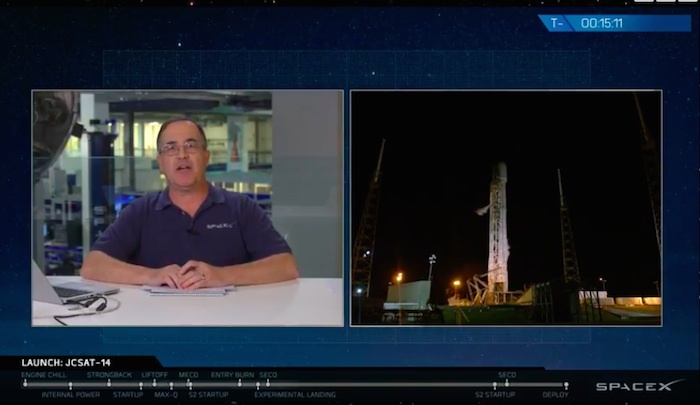 The company is going to need to master both landing types if it wants to recover and reuse as many of its rockets as possible. 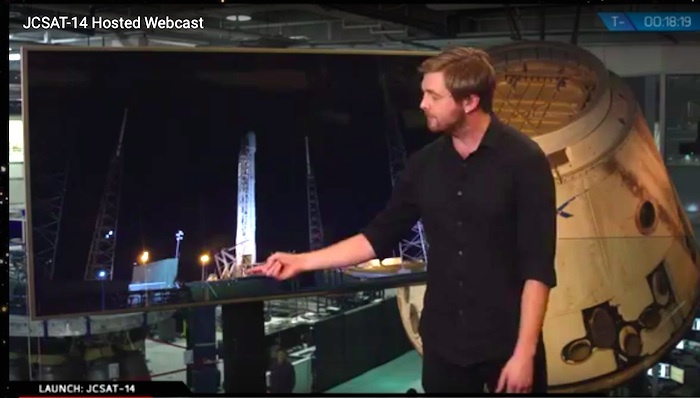 Despite SpaceX's low expectations for the landing, there is a 90 percent chance of favorable weather conditions for the launch itself, according to Patrick Air Force Base. 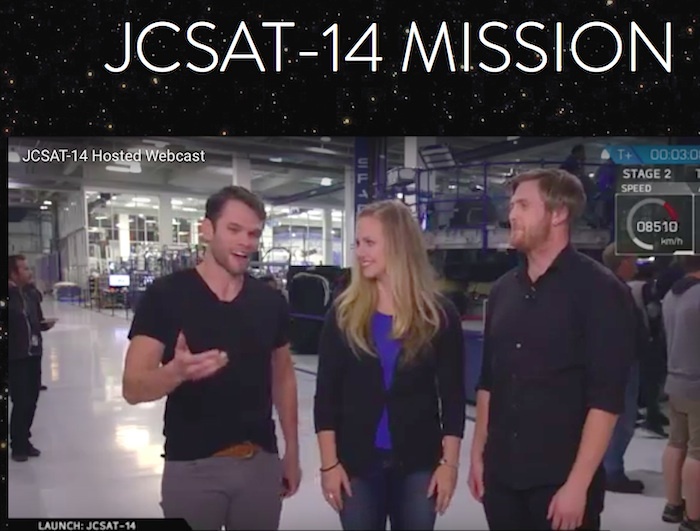 The JCSAT-14 satellite going up on this mission is meant to provide telecommunications coverage to Japan and Asia-Pacific regions, according to the probe's manufacturer, the JSAT Corporation. 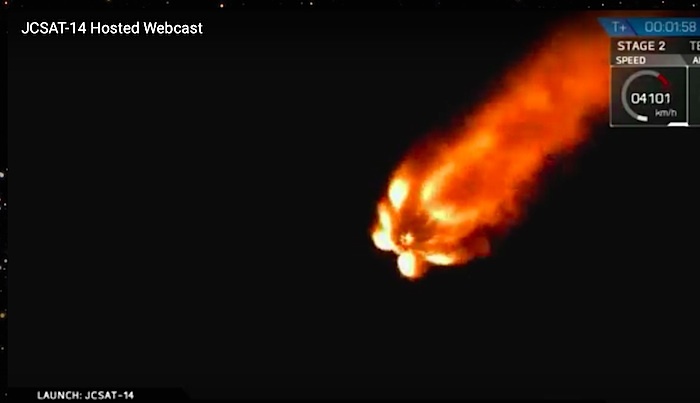 Check back here Friday morning to watch the launch and landing attempt live (if you're not asleep). 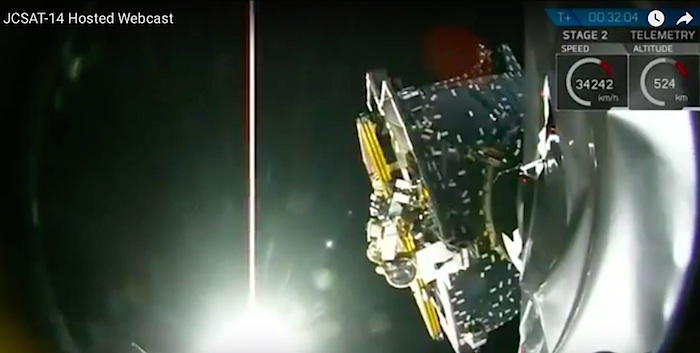 SpaceX successfully landed the first stage of its Falcon 9 rocket on a floating platform in the Atlantic Ocean early Friday after launching a Japanese communications satellite into orbit. 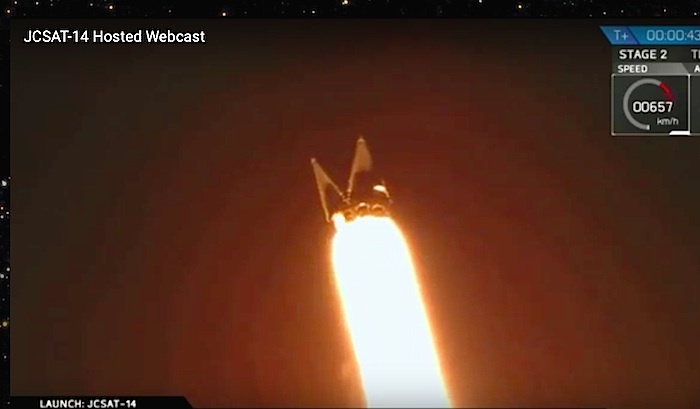 Shouts of "USA, USA, USA" and applause from the ground control crew greeted the feat, only the second time it has been accomplished by SpaceX, the company headed by Internet entrepreneur Elon Musk. 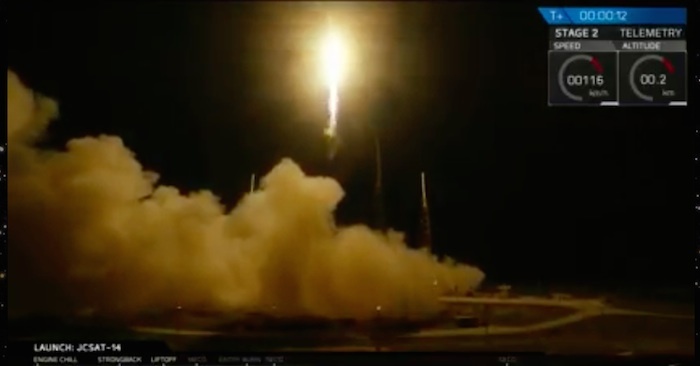 The two-stage rocket lifted off on schedule at 1:21 am (0521 GMT) with a telecommunications satellite owned by Japanese operator SKY Perfect JSAT. 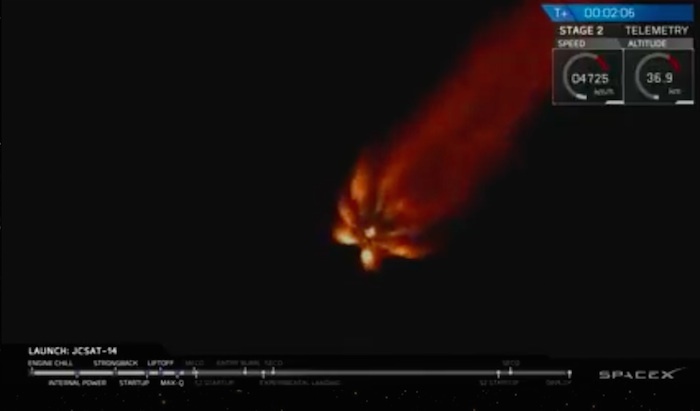 As the second stage moved into orbital position, the first stage fell back for the landing, firing its engine to re-enter the Earth's atmosphere. 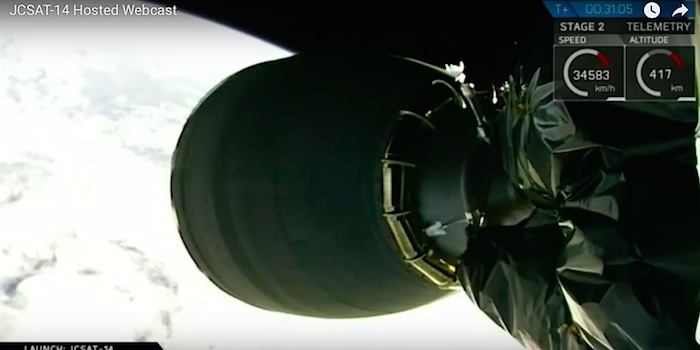 SpaceX had not expected to land the first stage successfully because of the returning rocket's high speed, but streaming video captured a picture-perfect touchdown. 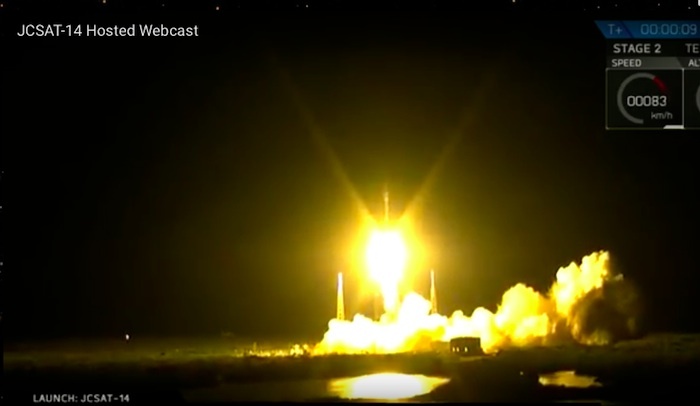 The California-based company pulled off such a landing last month for the first time, after launching an unmanned cargo ship to the International Space Station. 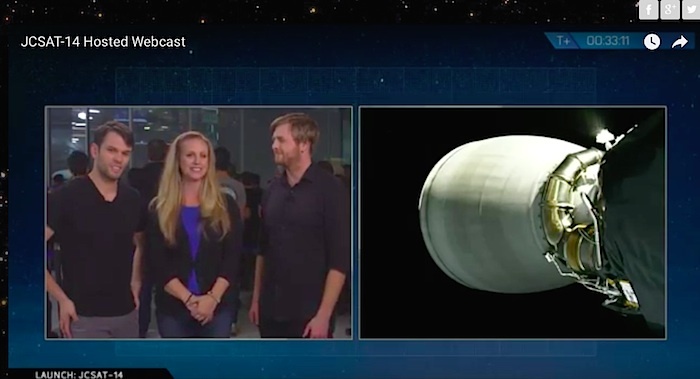 SpaceX wants to perfect the technique as part of its effort to re-use rocket parts instead of jettisoning the costly equipment into the ocean after each launch.